The Department of Environment and Energy (DoEE) has considered the proposal to establish and operate Stockyard Hill Wind Farm in accordance with Part 9 of the Environment Protection and Biodiversity Conservation Act 1999 (EPBC) Act, and decided to grant approval for the project, subject to conditions (Approval Decision EPBC 2016/7746). The conditions of the approval set out how impacts to threatened species and communities listed under Sections 18 and 18A of the EPBC Act will be mitigated and managed to acceptable levels, and specifically deals with the following listed species and associated habitat. Potential impacts to these species have been minimised following extensive surveys undertaken by qualified ecologists, and micro siting of the wind farm and associated infrastructure to avoid and minimise disturbance to existing known or suspected habitat to the extent practicable. In addition, offset management strategies have been developed for the Golden Sun Moth and Striped Legless Lizard which will see areas of known habitat protected and managed under covenants on an ongoing basis. The Victorian Government has approved the application to amend the Panning Permit that primarily increases the tip height to a maximum 180 metres. The amendment results in a reduction of 8 wind turbines from the 157 locations previously approved, however due to the increased height and higher rated turbine model, the energy generation capacity of the facility will increase by over 45%. 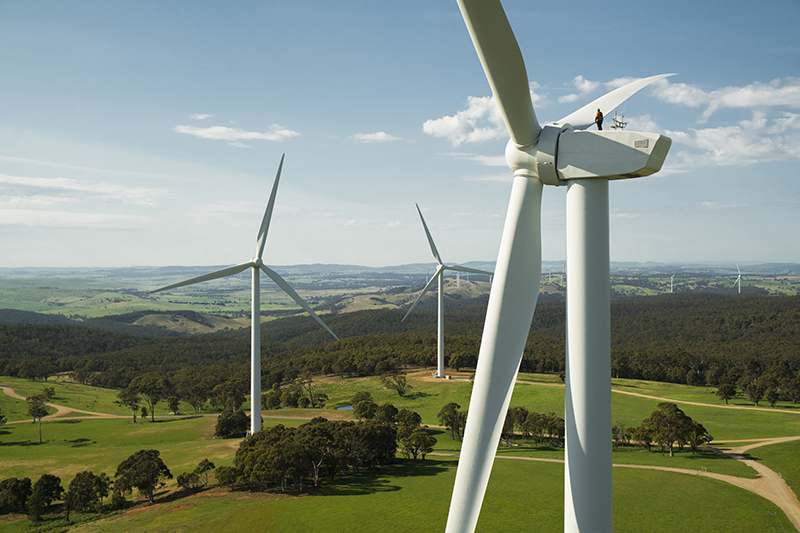 The Victorian Government has also approved permits to establish and operate an on-site quarry, and permits to allow removal of native vegetation associated with the overhead 132 kV powerlines required to connect the wind farm to the 500 kV network south of Lismore. The findings of the Planning Panel and copies of the associated permits can be found at the link below. The Department of Environment and Energy determined the project may have potential for a significant impact on matters of national environmental significance and is to be assessed by Preliminary Documentation. Further details on this process, including electronic copies of the documentation, is contained on the Planning page of this website. The SHWF project was referred to the Minister on 15 July 2016 under the Environment Protection and Biodiversity Conservation Act 1999 (EPBC Act). The EPBC Act referral deals specifically with potential impacts on matters of national environmental significance (MNES), being listed threatened species and communities (section 18 and 18A) protected under Part 3 of the EPBC Act. Following assessment of the referral, the Department of Environment and Energy (DoEE) determined the project may have potential for a significant impact on matters of national environmental significance and is to be assessed by Preliminary Documentation. The Preliminary Documentation sets out how the impacts of the project on matters of national environmental significance will be mitigated and managed to acceptable levels. Public comment was invited on the draft preliminary documentation between Tuesday 18 April 2017 to Tuesday 16 May 2017. No comments were received. An application to amend the planning permit for the Wind Farm with the Victorian Government, primarily to allow an increase in the tip height to 180 metres. The application was lodged in May 2016 and a request to amend this application (prior to public notice) lodged in August 2016. If approved, the amendment would result in a reduction of eight wind turbines, to a maximum 149 locations (compared to the 157 locations approved in the existing planning permit). Despite the reduced number of wind turbines, by using the latest wind turbine technology the project would generate approximately 40% more renewable electricity at a reduced long run average cost and deliver benefits to electricity consumers. SHWF also lodged planning permit applications for an on-site quarry and native vegetation removal associated with the overhead 132 kV powerlines required to connect the wind farm to the 500 kV network south of Lismore. These applications were exhibited for public notice in October and November 2016. The responsible authority for assessing these applications is the Victorian Minister for Planning. A Panel Hearing was held at Craigs Royal Hotel, Ballarat between Monday 6 February 2017 and Monday 20 February 2017. The planning panel will prepare a report with their recommendations and submit this to the Victorian Minister for Planning, who will use the report to guide his decision making in due course. SHWF is preparing an application to amend the Permit for the Stockyard Hill Wind Farm project (granted in October 2010) to increase the tip height from 132 to a maximum 165 meters. The application will be assessed by the Victorian Minister for Planning against relevant planning guidelines. Are you planning to build a new dwelling in or near the project area? key views from the dwelling site and potential visibility of the permitted wind turbines. These assessments are quite complex, so it is best to discuss these factors with SHWF early on the process when considering a new dwelling. You can contact us by calling 1800 753 730. For more information you can also view the Pyrenees Shire Council website. With a capacity of more than 30 MW, the Victorian Minister for Planning was the Responsible Authority for deciding on the planning applications. The project was assessed by the Minister for Planning under the Planning and Environment Act 1987 (P&E Act) and the associated Wind Energy Guidelines. In September 2008 the Minister for Planning determined that the project did not require an Environmental Effects Statement (EES), as the site offers scope to adjust infrastructure to avoid significant adverse environmental, heritage and amenity impacts. The Victorian Minister for Planning then appointed a panel to assess the planning applications, including the submissions received and undertake public hearings. A number of expert witnesses presented evidence at the panel hearings. The planning panel hearings to consider the Stockyard Hill Wind Farm concluded on 26 May 2010. The Panel submitted its recommendations on the project to the Minister for Planning at the end of August 2010. The planning panel report is available on the Department of Planning and Community Development website. On 29 October 2010, the Minister for Planning announced the approval for the Stockyard Hill Wind Farm and all of its associated planning permits, as well as the conditions that the project has to meet. The Minister's approval is for a 157-turbine wind energy facility. A background noise monitoring plan has been developed as per the conditions set out in the planning permit for Stockyard Hill Wind Farm. This plan includes information on the background noise monitoring locations, the noise monitoring methodology and the data analysis methodology for the development of the background noise limit curves. The background noise monitoring plan was approved by the Department of Planning and Community Development on 14 March 2012.